"Everything was positive -- the walls, the bed, the doors, the curtains, the phones, the sink, the whiteboard, the poles, the pump," said Dr. Scott Lorin, the hospital's president. "The mattress, the bed rails, the canister holes, the window shades, the ceiling, everything in the room was positive." "It is a creature from the black lagoon," said the CDC's Dr. Tom Chiller, who heads the fungal branch. "It bubbled up and now it is everywhere." The Centers for Disease Control said it "identified 51 clinical case-patients and 61 screening case-patients" in New York alone. The CDC reported 45% of the clinical case-patients died within 90 days. This hushed panic is playing out in hospitals around the world. Individual institutions and national, state and local governments have been reluctant to publicize outbreaks of resistant infections, arguing there is no point in scaring patients -- or prospective ones. Dr. Silke Schelenz, Royal Brompton's infectious disease specialist, found the lack of urgency from the government and hospital in the early stages of the outbreak "very, very frustrating." 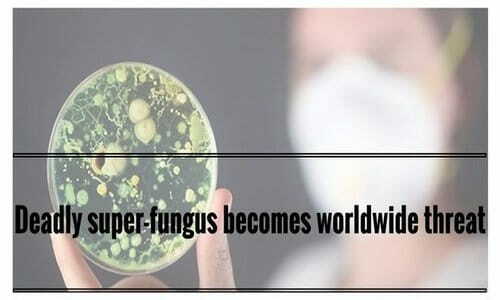 So we have been left totally in the dark about a "super fungus" that could potentially kill millions of us. And there isn't just one version of C. auris that the medical community has to contend with. Apparently there are four distinct versions, and they are all incredibly deadly. Of course those that do not know that they have been infected also don't know that they are spreading it either.